Our Three-Cans have been living side-by-side, in separate enclosures, for the 7 months since we adopted them. From what little information I have about their past, I don’t think they have ever really interacted without a wall in between them. Toco toucans are territorial birds by nature and do have the ability to easily injure each other, which is why we made the initial decision to keep them apart. I have always hoped for the day when they could all play together, but had assumed that I would have to wait until they were all further along in their training where I could introduce them properly outside, on neutral territory. I didn’t think it would set the situation up for success to bring one bird into another bird’s domain. And because Paco is the only one who plays with me outside at this point, I have not given much more thought into socializing them together until now. The last time we had all three birds out of their aviaries was in October (see: Toucan Slumber Party). We decided to use the opportunity to switch up their cages, both to keep things fresh and also to separate Paco and Pepe, who frequently banged beaks through the cage wire, semi-aggressively. About this same time frame, we received the results from their avian gender test and discovered that Pepe and Paco were males, and Paz was the female. Once we housed our little peacekeeper, Paz, in between the two boys, the beak banging stopped and a love connection between Paz and Pepe was born. Over the past 4 months, Paz and Pepe have become increasingly more interested in each other. They spend a lot of time in their separate aviaries, sitting on their perches closest to their adjoining wall, purring at each other. As breeding season has begun, they have been more insistent with trying to feed each other fruit and treats through the cage wire – a courtship behavior in Toco toucans. It has never been our intention to breed the toucans; our goal in adopting them was just to provide them with the best life possible. But it has become more and more apparent that in order for Paz and Pepe to be truly happy, they would like to be together. Unfortunately, neither of them seem to have a desire to spend time outdoors, making the neutral territory introduction idea a moot point. After some contemplation and research, we decided to build a door in between their aviaries to introduce them and see if they might possibly get along well enough to live together. Rather than taking down the whole wall right off the bat, the door would allow us to still keep them divided should peaceable cohabitation not be viable. Prior to socializing the birds together, I spoke with toucan breeding expert Jerry Jennings, Owner of Emerald Forest Bird Gardens, about how to ensure a safe and positive introduction. He kindly gave me his time providing valuable information as to when it would be necessary to separate them (should one chase down another to the point of exhaustion) and also gave me reassuring tips such as a bit of intense beak fencing between a male and female was a perfectly normal, even necessary, behavior in toucan courtship. I also felt confident in my knowledge of our individual birds’ personalities and their body language, which made me believe this would be a successful situation that I could control should things go south. Both Paz and Pepe have a generally easy-going, non-confrontational disposition. I figured that neither one of them had the temperament to chase down the other aggressively (as I expect Paco most likely would do) and knew they would be easy to separate by simply getting in the middle should things get heated. The birds were quite excited while we put in the door, as though they already predicted the outcome. When we first opened it up between them, Paz hopped right in to meet Pepe. They had a few interactions of beak fencing, but broke apart quickly and mostly just gave each other their space. Neither toucan appeared overly stressed nor did one seem more dominant over the other. We allowed them to spend a few different hour-long sessions together, then kept them separate when we were not available to supervise. Today is Day 4 since we installed the door and they have pretty much spent the entire day together. Toucans certainly don’t seem as cuddly with one another as some parrots do. I have read that toucans give each other more space due to the length of their beak, which certainly makes sense to me – even if they wanted to preen each other, it would have to be at a slight distance to not overshoot their target! It has been sweet to see them sitting two feet apart, resting, or even playing near each other, picking toys out of the same box. They have yet to actually give each other fruit or a treat from their beaks, as they seemed to so often desire when the cage wire was present to separate them, but I am sure that will come with time as they build their trust in each other. The nice thing about them is that they give each other their space, often enjoying time farther apart in the aviaries, then coming back together when they feel like interacting. With each day that passes, we all gain a bit more confidence in each other. For two birds who have never had the ability to live with another, it will take them time to be fully comfortable in each other’s space. We plan on watching carefully as their relationship develops and if they continue to seem at peace living with each other, we will take down the wall to expand their space into one aviary. We think it is probably unlikely that they will mate, as Toco toucans are notoriously difficult to breed in captivity, but for us, it’s enough to see them happily enjoying each other’s company. 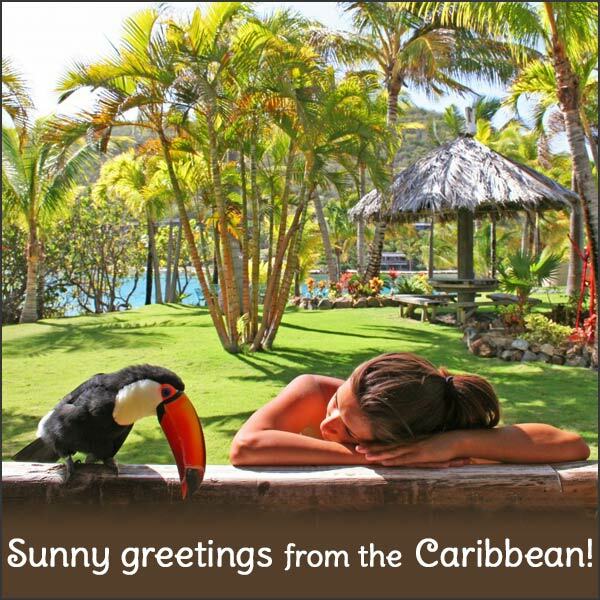 This entry was posted in Care, General Info and tagged Adventures in Toucanland, bird, birds, BVI, Caribbean birds, exotic birds, exotic pets, island, Paco, Paz, Pepe, pet, pet bird, pet birds, pets, Saba Rock, socializing birds, socializing Tocos, socializing toucans, Toco, Toco Toucan, Tocos, Toucan, toucanland, toucans, tropical birds, tucan, tucans by Toucan Lady. Bookmark the permalink. This is so heart warming! You are amazing Chrissann!